If you live anywhere in New England then at some point in the past few days you've probably had a conversation about snow. You have probably had at least one, if not several, events canceled or postponed due to snow. You are likely sick of shoveling and cursing yourself for not buying that snow-blower that was on sale last June. If you ski or snowshoe you've not had to travel far to make use of them and they may have been your only way to get to the corner store, to work or to overcome your serious cabin fever in the middle of storm number three (and besides, snowshoeing down the middle of Main Street is kinda cool). If you don't live here and you have tried to fly into one our airports in the past few weeks there is a good chance your flight was delayed, canceled or rerouted. If you found yourself stuck here, unable to leave due the storm you now have a Winter of 2015 story to tell the kids. You've probably told friends how you are glad this is not something you have to deal with regularly and what's with those crazy people who live in places where something like winter exists anyway? Should we start taking up some sort of collection for them? 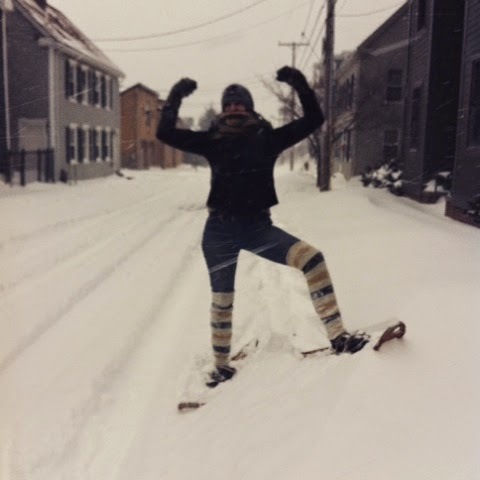 I can't say I love winter but I have always been tolerant and accepting of it and I've come to enjoy it a whole lot more since I discovered snowshoeing, I'm not one of those folks depressed by snow and I make sure I dress appropriately for the cold when I go out so cold isn't often an issue. In general winter does not impinge on my social life or cause any undue burden. 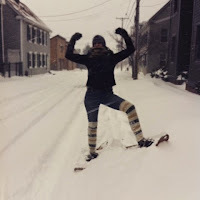 In the early part of this winter I'd even lamented the warm days and serious lack of snow which prohibited my having any snowshoe adventures. But now I've have missed four days of school and two of my classes have had to issue multiple syllabus updates. As I tend to make keep track of my life based on my school schedule I'm not sure what day of the week it is most days let alone what is actually due for class. I've made and rescheduled plans with one particular friend so many times that we are considering setting up a Skype date and then meet in person if there ISN'T a blizzard that night. Like most everyone I'm feeling totally overwhelmed with snow. When I began writing this post a few days ago we were forecast to have and 12 - 18 inches fall upon us today. As of right now we've had about 4 inches and there is a bright spot of sun attempting to burn through the clouds. I'm feeling a mix of ENOUGH ALREADY relief and darn, I really wanted to snowshoe in the falling, blustery snow today. My mind is moving towards metaphor and my efforts towards self-discovery these past few months. I began this attempt in the late fall as the weather turned cold. I was trying to figure out just what it was I wanted in life and to equip myself with the self knowledge that I needed to make some decisions I'd soon be facing. I started seeing my therapist again, did a lot of journaling and contemplation. I seemed to be doing all of the right things and though I didn't seem to be making a whole lot of progress, I at least felt like I was doing something. Fast forward to about a month ago, right as our first storm it. I'm now writing regularly in my journal about feelings of depression that I've been waking up to each morning (something new to me as my emotional struggles have always been late night insomnia inducing ones). I've been working through a personal inventory that brings me face to face with those sorts of personality flaws that we'd all prefer to pretend we don't have (most of which I'd been well aware of but...you know, denial). I have a series of conversations with friends that seem to confirm all my fears of being a horrible failure of a human being. Most are initiated by me, one is out of the blue unexpected, one is delivered with seeming relish...all leave me feeling a bit battered, low and questioning everything. I'm a heaping pile of doubt. Somehow I don't shut down. I don't run for the hills. I don't bury myself in being busy. I do give in to a bit of wallowing. I recognize that I asked for this when I started down this road in the fall. I can't say I expected, much like the storms of the past few weeks, to have as much dumped on my psyche as has been but whatever the mental equivalent of shovels and snowshoes are, I'll be attempting to dig myself out keep moving forward.